Alice has warned me that if I blog about this she won’t be talking to me, but it is just so hilarious that I can’t resist! 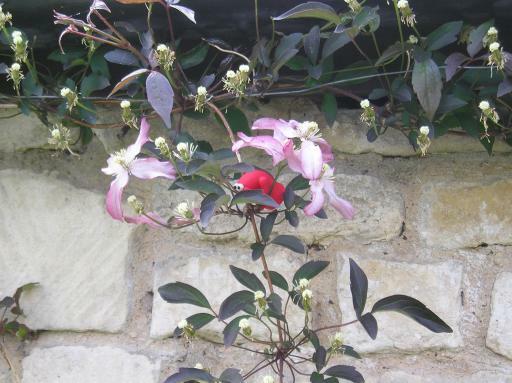 I’m not entirely sure how she managed it but I heard a pathetic little voice calling for help and when I went out onto the great Plain in front of the house (the humans call it a Lawn), there was Alice hanging in the Clematis that the humans have growing up their wall. She was very near the top of the garage, as it happened, and was swaying precariously. I ran off to get a rescue team at once, but by the time I got back, one of the Humans had spotted Alice and disentangled her and put her back on the ground. She reckons that she overheard the humans saying the gutter was blocked and so she had decided to climb up the flowers to try and unblock it, being a naturally helpful Wiggly Pet. Unfortunately, there is a reason we like to do things in teams, and this sort of incident is one of them. Of course Alice reckons it’s all my fault because she’d asked me to come and help, and after waiting five hours for me had got cheesed off, bored, and then cheesed off again, and so went and tried to do it herself. I think she would agree that it was a satisfactory adventure that she had (she’s just said that it was not, and if this goes live, I’m going to be in more trouble than I could shake a stick at. I think it may have been a mistake to just point out that we’re too small to pick up sticks).